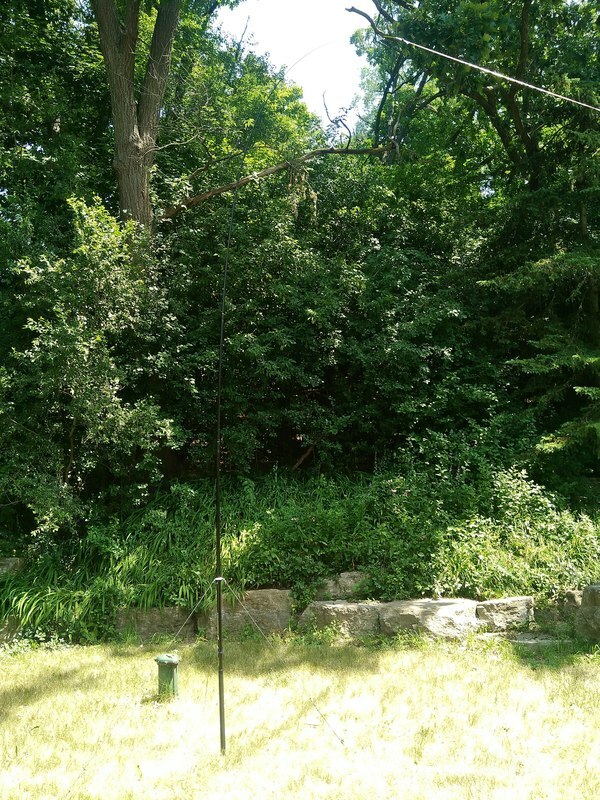 This simple antenna consists of a 35 ft piece of small gauge wire as the radiator, a 35 ft counterpoise, a 9:1 UNUN and a BNC jack to connect the feed line. For a feed line I use RG174 coax. 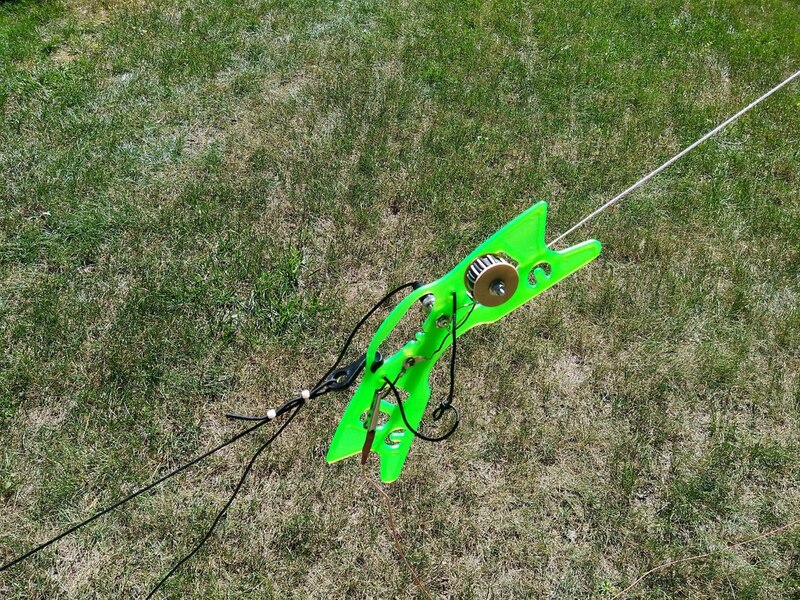 I assembled everything onto a Sotabeams wire winder including the counterpoise, so the whole thing is a self contained, easy to deploy portable antenna. I've used it mostly with 17 to 20 ft fiberglass fishing pole masts and connect the antenna to the mast tip with shock cord and a cord lock. 2019-03-30 After being ignored for quite a while I put up this 35 ft end fed again yesterday afternoon. Almost immediately, using my x5105 at 5 watts I got a contact on 30 meters with a station 660 miles southeast in South Carolina! 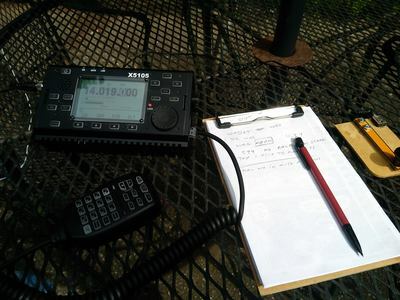 Then this afternoon I fired up the x5105 again and discovered that an SSB contest was going on. So I decided to see if I could make any more contacts. The result was five SSB contacts. Two were on 20 meters with a station 1200 miles southeast in Florida and one 1780 miles west in California. The other three were on 40 meters all in the 600 to 700 mile range to the southeast. All five of them were fairly tough going for them but about 59 for me. 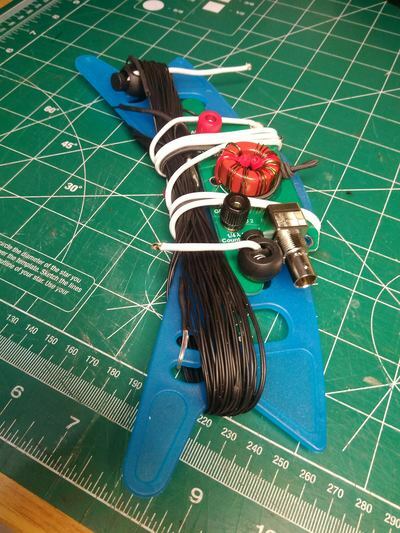 This little antenna is pretty versatile and does a reasonable job. I wished I'd had my 40 meter EFHW up so I could switch between them and make some on air comparisons but that didn't happen. Thinking about our upcoming Boundary Waters canoe trip, I'm pretty sure this antenna will be in the bag. 2018-11-20 Yesterday, after being gone over the weekend I strung up my 35' end fed wire antenna using the 5.4 meter Bamboo Pattern 11 Section Telescoping Fishing Rod mast and 3 feet of RG174 to go between the feed point and the feed-through in my window. It's too cold and breezy to actually operate outside. From the feed-through a piece of RG58 goes to the Xiegu X5105. One of the things I like about this 35' wire antenna is that I can tune it on just about any band with the x5105's internal tuner. granted it may not perform "wonderfully" on every band but it at least gives me an opportunity. Not long after putting it up I had a short CW QSO on 40 meters with K3ESE just under 700 miles east in Maryland. I tuned around and heard several strong signals on 20 meters but didn't land anyone. Then this morning around 9am I had another 40 meter CW QSO with KA9FCZ 270 miles south in Illinois. We had about a 20 minute rag chew when suddenly signals faded out. He started at 599 and gave me a 559 at the start. He was running 70 watts, I was running 5 watts. My conclusion? It still works and is a viable simple-to-put-up antenna. Likely if I ever get out of my back yard it will be in my pack. 2018-10-30 Yesterday I decided to take down my trap inverted vee after a couple QSOs with it and put the 35 ft end fed up again. Part of the reason is that with the bands in their current rough shape I wanted to be able to change bands easily. The link inverted vee is a great option except that it requires one to run outside and clip/unclip the alligator clips to change bands. Not the worst thing in the world, even giving you a bit of exercise, but nevertheless a bother. Whereas with the 35 ft-er I can just push the tune button on my Xiegu X5105 and be ready to go. But this time I decided to suspend it from a tree rather than from one of my fiberglass push up poles/masts. And that gave me a chance to play with my Arborists throw line and weight! I have the bag to store and deploy it with too. I've always been a bit too self-conscious to go out into my yard and throw it into the trees for fear of what the neighbors would think! But this was the time. I need some practice. It took several throws to get it even close to where I wanted it! However, it does work very well. the 12 oz weight seems just about right and that throw line is very light and very tangle proof. Quite an improvement over a plastic drink bottle tied onto the end of nylon paracord or something similar which seems to be designed to snag and tangle AND getting stuck in the tree! I'd add a photo except that the #26 black wire is simply invisible except in rare light conditions. But suffice it to say it is much nearer vertical than when using my masts. Haven't had any QSOs with it but will today. 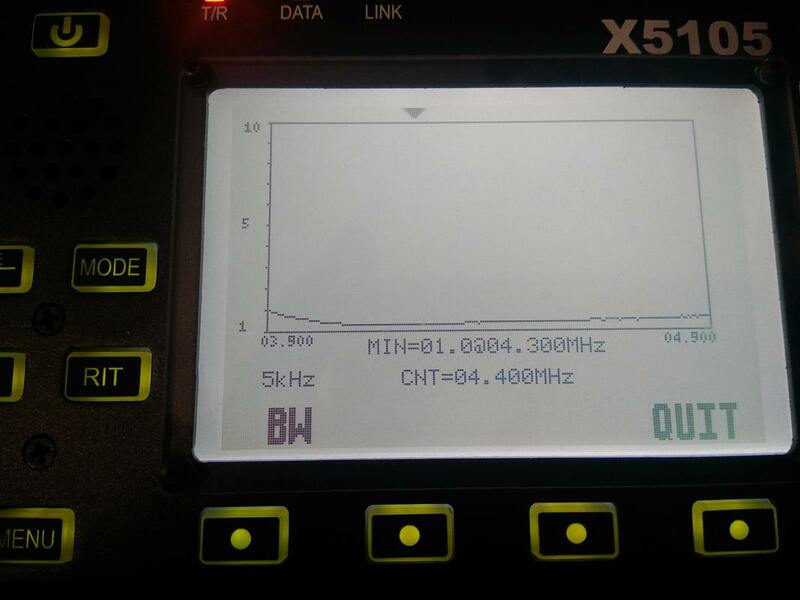 2018-10-20 Using the SWR analyzer built into my X5105 I checked the resonant frequency of the 35 ft antenna with 35 ft counterpoise. 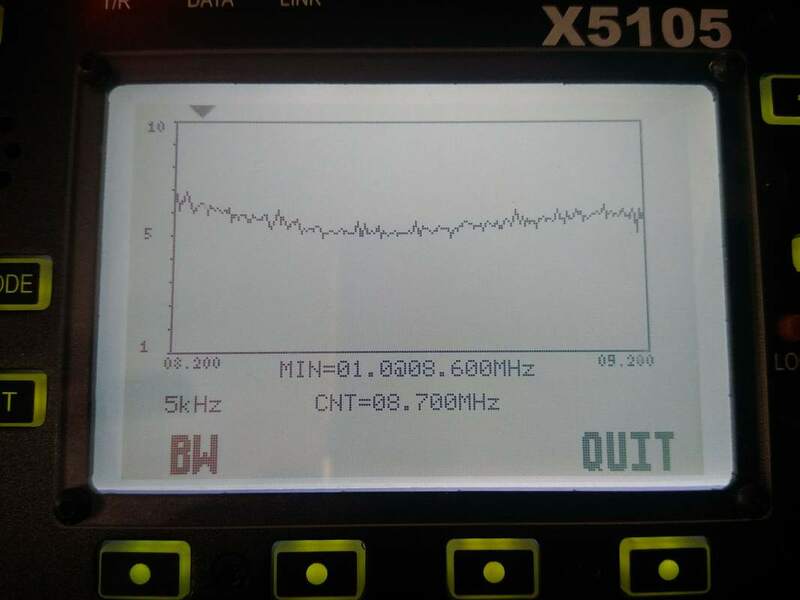 it appears to be 8.6mhz. It also shows resonance at 4.3 and 17.0 mhz which would be expected. I made these measurements at the transmit side of the 9:1 unun. 2018-10-19 I know this is not the greatest antenna in the world, but I also know it is a reasonable one! I had two more QSOs this afternoon and evening, on 40 meters. One was with a station in Texas, 950 miles with a 599 report, and the other with one in Louisanna, 850 miles and a 449 report. Both with my five watt x5105. The Texas one was one of those strange openings as he was absolutely booming in here for a little bit then faded way down. With Louisianan it was normal band conditions as that signal was a 549 in here. Every time I give this antenna a chance I'm pleased. it is so easy to put up and just works. 2018-10-18 Today I put up this 35 foot antenna again. This time with the 20 ft. Wonderpole since I already had it out there for some contacts with my trap 20/40 Inverted vee and my link 20/30/40 meter inverted vee. I had had good success with these two the past couple days so wanted to compare it over the next days. I was immediately impressed once again how well it hears and how easily the x5105 tunes it. I used about six feet of coax from the unun to the radio rather than a 25 ft piece of RG174. Within just a short time I had a QSO with W3ZRW in Maryland, 645 miles east. He responded to my CQ on 30 meters. He was running 10 watts with an Icom IC703 and I forgot what antenna he was using. I was running 5 watts with my x5105 and this antenna. He gave me a 559 and he was 449 in here. I don't know the directional characteristics of the antenna. For convenience it is strung south to north with the feed end to the south. 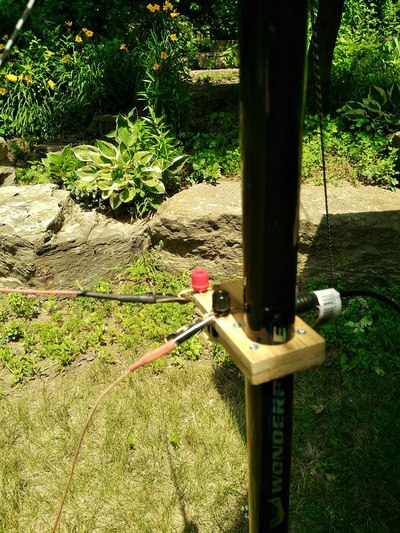 The Counterpoise, a 35 foot piece of wire runs along the ground, parallel and beneath the antenna. 2018-09-18 Well, I decided to mount the QRPGuys unun onto a Sotabeams wire winder. To make the whole thing a bit more compact I cut off the half of the unun board that serves as a handle. Turned out pretty nice If I do have to say so myself. I like this arrangement over the QRPGuys unun and board alone. 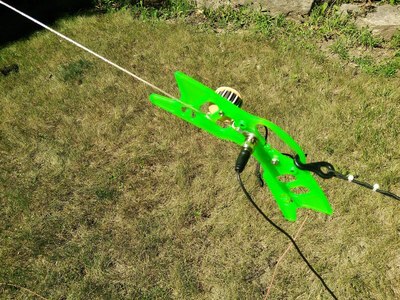 The longer and curved shape of the Sotabeams winder winds, stores and unwinds the antenna and counterpoise neater and quicker and about half the number of turns are needed thanks to its length. I always wind both the antenna and counterpoise in a figure 8 pattern which eliminates twists in the wire and simplifies removal. The banana jacks make it easy to change wire elements if so desired. Currently the antenna is permanently attached but the counterpoise has a banana plug. That makes deploying both simpler than having both attached. Simply unwind and lay out the counterpoise on the ground with the banana plug near the feed end. 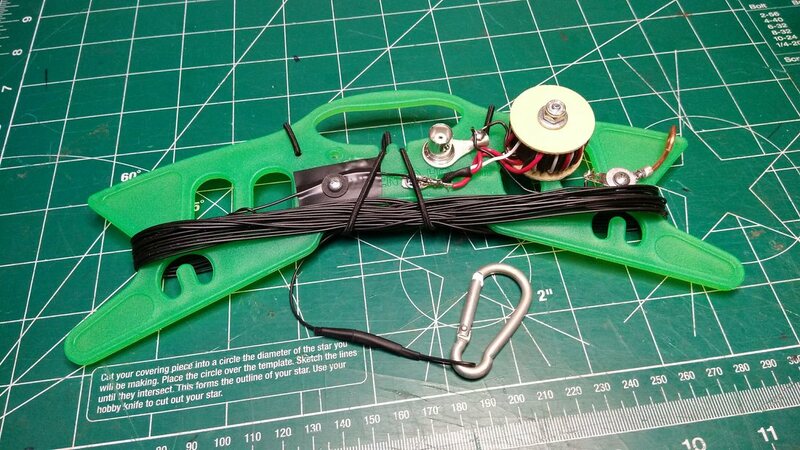 Then attach the end of the antenna to the support mast and unwind it back toward the feed end. 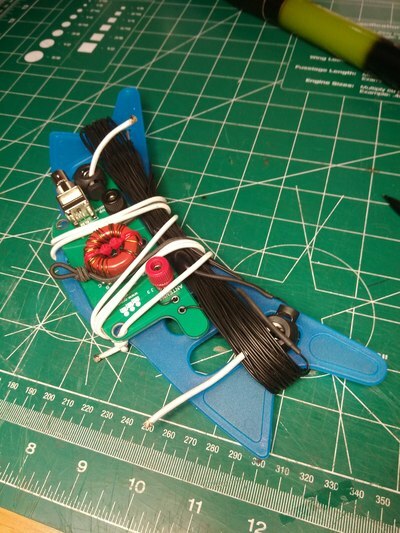 Once that is done and tied off, simply plug in the counterpoise, attach the coax and you're ready to go. When taking it down I lower the support and wind the antenna first and then wind the counterpoise over that. The length of white shock cord serves to tie the winder/balun to a tent stake, tree branch or whatever. 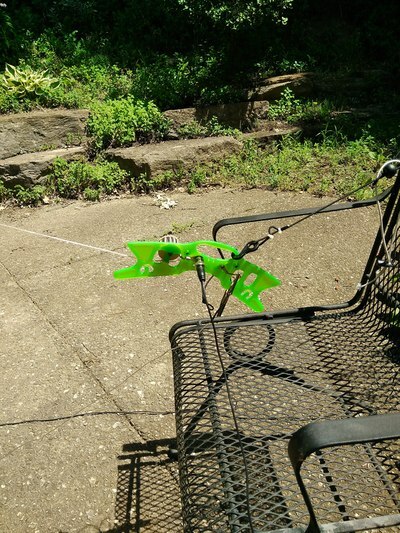 It also can be wound around the winder once the antenna and counterpoise are wound onto it to keep everything secure. 2018-09-17 I think I'm going back to the Sotabeams winder version of the antenna. I like the small size of QRPGuys version, but their winder is just too small and is somewhat inconvenient to wind and unwind. I came to this conclusion this afternoon when I took down my antenna after playing with it today with my X5105 transceiver. The mosquitoes ate me alive as I was winding up the antenna and counterpoise! So, tonight I transferred the main element and counterpoise to the Sotabeams winder. I'll test it tomorrow or Wednesday. If for some reason that home made 9:1 Unun dosen't work as well as the QRPGuys one, I'll probably cut down their winder and mount it on the Sotabeams one to get the best of both worlds! Having said that, the QRPGuys one with the 35 ft main element and counterpoise works well. I had a CW QSO with a station 1600 miles west in Washington State on 20 meters. He gave me a 569 and he was 589 in here. He was running 100 watts into a beam up 60 feet so he gets some of the credit! But my end worked well. I still love this antenna. QRPGuys 9:1 unun/winder with #26 silky wire from The Wireman for both the antenna and counterpoise. Both are 35 ft long. It works but is a bit squished. 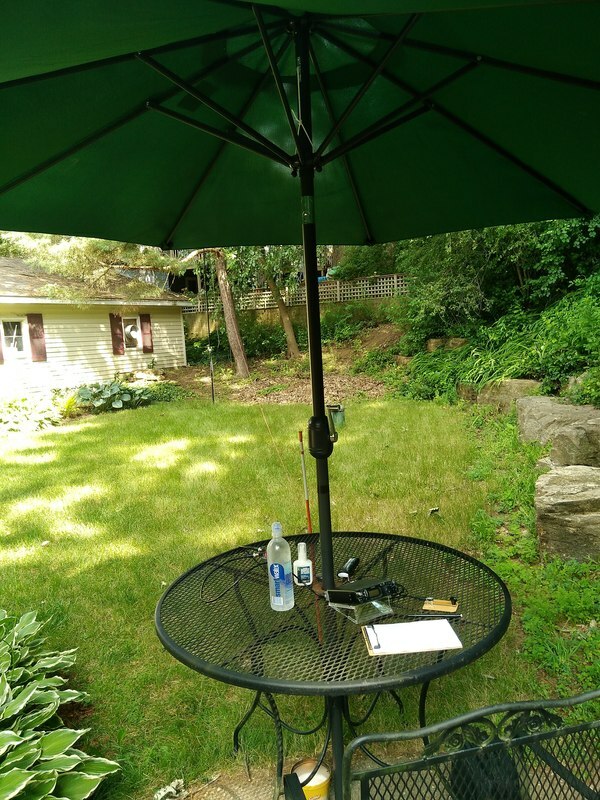 2018-09-08 Today I set up the 35' antenna again using the QRPGuys unun about 11:00am. As indicated below, the x5105 once again tuned it well. Bands weren't real busy but with an SKCC Weekend Sprint (WES) under way there were a number of CW signals, on 40 and 20. I snagged one CW contact on 20 with a good report. Then I had to take down my mast so my grandson could mow the yard. 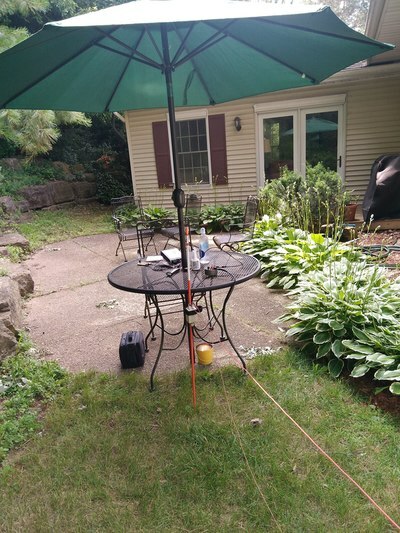 QRP Guys 9:1 unun/wire winder set up with the #26 stealth 35' element and #24 RCA speaker wire 35' counterpoise. 2018-09-06 After emailing Ken at QRPGuys.com about their unun/winder I moved the Silky 26GA antenna wire from The Wireman Inc. (their part number 534) to the QRP Guys unun/winder. Then I put it up using my 5.4 meter Bamboo Pattern 11 Section Telescoping Fishing Rod mast, a 35ft counterpoise and connected it to my X5105 rig. The internal tuner of the x5105 was able to match to a 1.5:1 or lower SWR on all bands from 80 through 6 meters. On 160 meters 2.5:1 is the best it could do! I didn't try any contacts on any of those bands but heard a number of signals. So, with the smaller "stealth" wire I'm pretty impressed that this is a great little antenna solution. total weight, including the #24 RCA speaker wire counterpoise was 4.5 oz. if one replaced that with the stealth wire it would reduce the weight another ounce to ounce and a half. 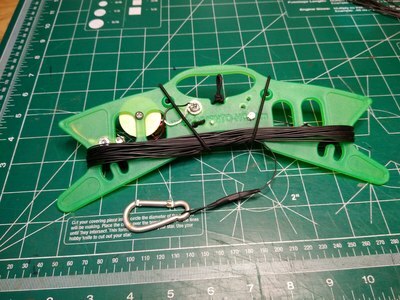 In my opinion the winder could be improved by making the ears a bit longer and angled out (to the left in the picture above) to make winding the element in a figure eight patter a bit easier. I really like winding in the figure eight as it keeps the wire from becoming twisted and makes for very easy unwinding. But that is a very small issue. 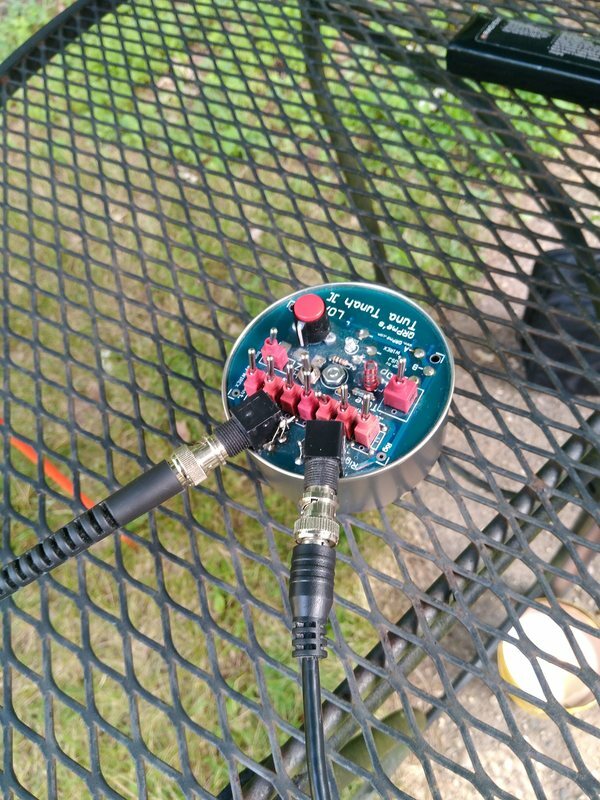 It is more than well worth the $15 and I recommend it for portable QRP operation using an end fed antenna. 2018-09-05 If you don't want to scrounge the parts and figure out your own 9:1 unun and wire winder, QRP Guys sell a great little product that is worth looking into. Mine arrived yesterday so I assembled it (only took about an hour) and added a 35 ft element and 25 ft counterpoise cut from RCA small gauge speaker wire. This morning I took it outside and put it up using my 5.4 meter Bamboo Pattern 11 Section Telescoping Fishing Rod mast and X5105 rig. It tuned up on 80, 40, 30 and 20 just fine. I didn't check the bands above those but I'm fairly certain it will tune those also. My hope was that it would be lighter, smaller and neater than my home brew version described below. It is lighter by about half an ounce, 4.65 oz, vs. 5.05 oz. It may be somewhat smaller but not much, just a different shape. As to neatness, it is not neater. QRP Guys Portable UnUnTenna 40m-10m with a 35 ft element and 25 ft counterpoise, both made of small gauge RCA speaker wire. It is not designed well for winding the elements directly on it whereas my home brew version is, as it is built on a wire winder intended for that purpose. The toroid is a bit smaller and I like the BNC connector. I'm contemplating cutting off the handle portion of the QRP Guys one and mounting it on a wire winder, thus maybe getting the best of both worlds! Bottom line, it is a good product and I recommend it, especially if you don't want to design one and scrounge parts. 2018-08-29 I've had problems tuning the 35 ft wire on 30 meters. Also I've noticed that at least some suggest a 35 ft counterpoise. I've been using a 15 foot one. So I decided to make up and try a 35 ft counterpoise. I made it with #26 (I think) RCA speaker wire. The good news is that by X5105 transceiver's auto tuner will now tune everything from 40 through 6 meters, including 30 meters. The bands were absolutely dead this afternoon while I was playing with it so I can't comment on how it actually works. Antennas are both fun and frustrating! Almost impossible to know how they really work, particularly in this crazy propagation situation. 2018-08-14 Bands are not good at all right now. All but 40 and 80 show as poor the during the day neither is shown as better than fair. But I decided to string up the 35 ft antenna anyway and give it a go with my FT817nd and Tuna Tunah II. 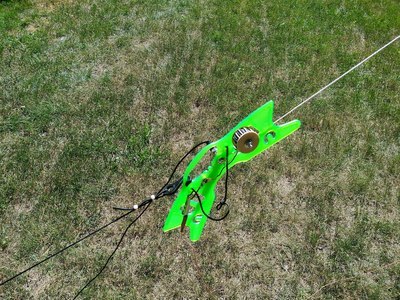 I used the shorter mast and connected the antenna to it using a short piece of shock cord and cord lock. I was surprised to find several pretty strong signals on both 40 and 20 and even on 30 meters. I was able to land a QSO with K3IMC (685 miles) using 5 watts on 20 meters. He was a 549 in here and gave me a 559. That was around 2:00pm. Later, at 4:15pm I had a QRP to QRP QSO with VE2PID in Quebec (about 840 miles) on 30 meters. He was 539 and gave me a 559. He was running a KX2 at 5 watts. I continue to be impressed with this simple antenna. Shock cord and lock used to attach end of 35ft wire to the fishing pole mast. 2018-07-25 After repairing/bypassing the broken switch on my Tuna Tunah II and modifying the tuna can, I had about a half hour just after lunch and decided to see if it all works. So I headed to the back yard, put up the antenna, connected all the pieces together and turned the FT-817 on. Forty meters sounded dead but tuned up well. Twenty sounded better and also tuned up nicely. I heard but could not raise the YL System operator on 14.332 so tuned down to CW end. 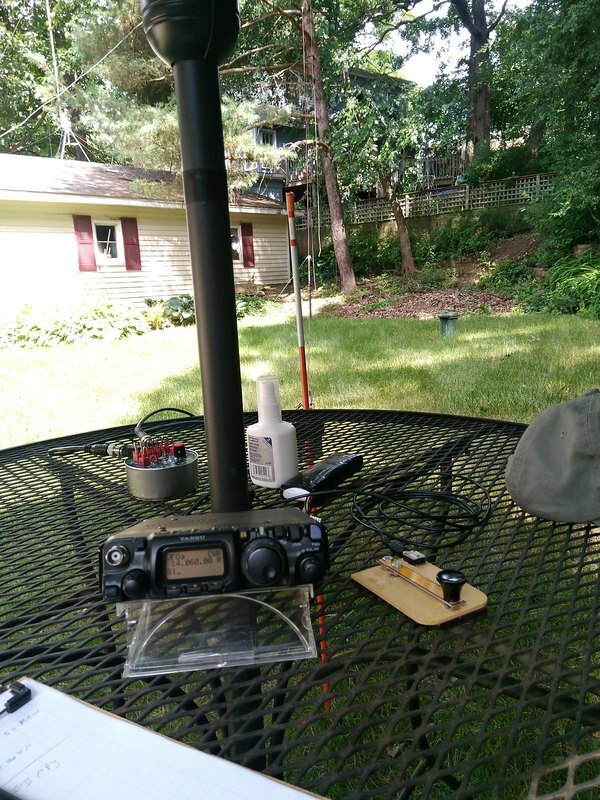 Had a nice 5 watt 559 QSO with AH6AX in Maryland on 14.052mhz. So once again the antenna, tuner and rig work. Didn't have time to try the EMTECH ZM-2 tuner. 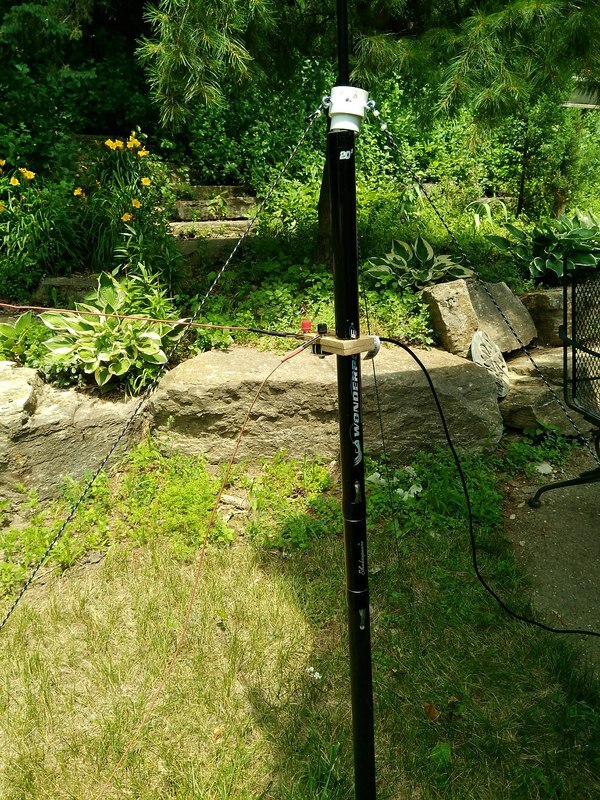 2018-07-21 The weather improved this afternoon so I set up the 35 ft end fed. Without the 15 ft. counterpoise I simply could not tune it on 40 meters with either the EMTECH ZM-2 tuner or the Tuna Tunah II. But with the counterpoise attached it tuned tunes quite nicely on 40, 30 and 20, the only bands I checked. The EMTECH has fallen out of favor with me as it does not seem to handle the task of tuning this antenna very well at all for some reason. When I had the 4:1 balun connected I was impressed with it. But with the 9:1 unun not so much. On the other hand the Tuna Tunah II worked on all bands. I'm not sure I trust my "data" at this point and will keep playing before making a final decision about the tuner thing. Using the counterpoise and the Tuna tuna II I logged a 20 meter CW contact with W5I in Sherman, TX. He was about 589 in here. He gave me a 599 but I think that is suspect. But it worked which is what counts. 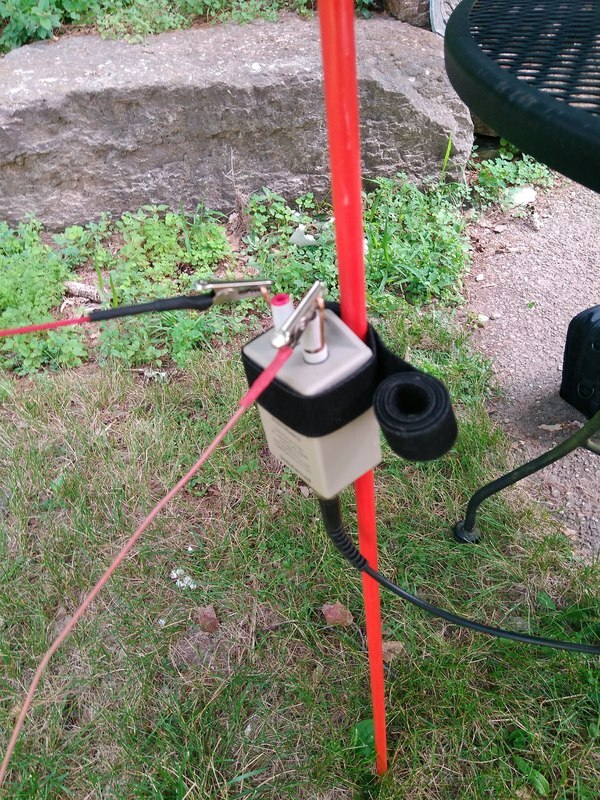 2018-07-20 After a couple days away helping my son celebrate his son's birthday on a camping trip, I decided to replace the speaker wire on this antenna with some new wire I ordered from The Wireman Inc. . The new wire is Silky 26GA antenna wire, their part number 534. It is extremely light, fairly strong and jet black, making it more stealthy than the speaker wire. It is not important but the finished product weighs 4 oz. I was unable to use it on air as we are right in the middle of a significant rain event which is keeping me in doors. Maybe tomorrow. At this point I plan to use the 15 ft clip on speaker wire counterpoise when needed. 2018-07-13a I was suspect of my tiny 9:1 unun I made earlier today. Not exactly sure why, but decided to try to add a third winding to my original 4:1 balun which I was using previously. It is one I removed from an old MFJ tuner several years ago. I was successful in finding some wire nearly identical to the other two windings and get it snugged in between the existing ones. Then mounted it on the line winder in place of that tiny one. Still didn't manage any contacts but did get some measurements with the antenna analyzer. It was quite similar to the readings with the tiny 9:1 unun but not identical. One interesting difference was the resonant frequency without a tuner. Whereas with the tiny unun it was 17.288 mhz, it measured 22.7 mhz. I noted adding or removing the counterpoise made no difference. The SWR at 7.05 mhz was 3.5:1 rather than 2.2:1! That was a surprise. The other measurements were very similar. That was with the ZM-2 tuner. I noticed that on 40 meters the capacitors were at their extreme settings so I couldn't really get a sharp dip so I decided to try my trusty old Tuna Tunah II. Another surprise. With it I was able to get a better than 1.2:1 SWR on 40, 30, 20 and 15 meters. Seems it can handle a wider range of complex impedance than the ZM-2. Now, what do I do?! I was falling in love with the ZM-2. Now I'm leaning back toward my old girlfriend, the Tuna Tunah II. Woe is me. The moral to the story? There is no perfect solution! :-) Yes, I knew that! 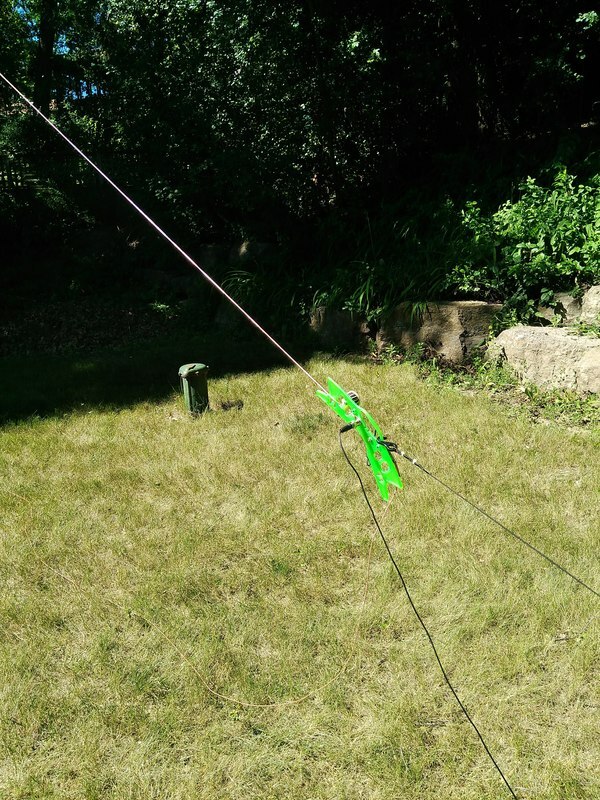 2018-07-13 I noted that on the web site that sells the 35 ft antenna he uses a 9:1 unun rather than a 4:1 balun like I've been using. He also says no counterpoise is needed as the 25ft of coax strung out more or less the opposite direction of the radiator serves as a counterpoise. So I decided to build a 9:1 unun and test it out. I only had a 1/2 inch toroidal core with the red code marking on it which seems to be best in the 3-30mhz frequency range. So using some small enameled wire, probably about 28 gauge I wound ten trifiler turns, the most I could pack in neatly. and wired it up as indicated in the link above. It tuned nicely on 20 meters with a 1.2:1 SWR on the antenna analyzer. Adding the 15 ft. counterpoise actually made it worse. On 40 meters the best I could get was a 2.2:1 SWR and again the counterpoise made it worse. On 30 meters I cot a 1:1 SWR and on 15 meters I got a 1.0:1 SWR. All of that was through my ZM-2 tuner. 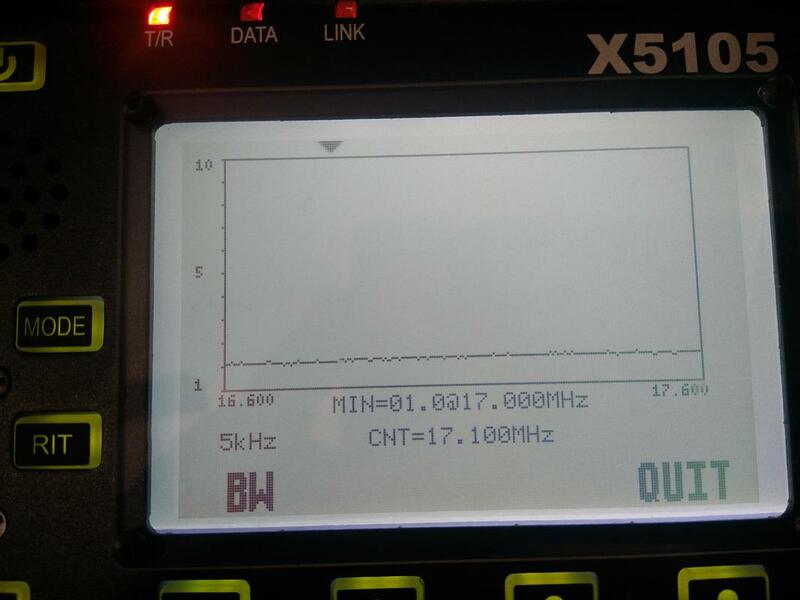 When I ran the feedline directly from the antenna to the analyzer I found the resonant frequency of the antenna was 17.288 with an SWR of 1.0:1. Band conditions weren't good, with very few signals in the CW portion so I haven't tried it "online" yet. I guess I'm not sure what I have learned as I didn't run analyzer checks with the4:1 balun. However the counterpoise always provided better tuning with the 4:1 balun and I noticed some hand effect on some frequencies with it. I suppose the radiating effectiveness of the antenna is more or less unaffected by the feed arrangement if it tunes well. Perhaps I will do more testing. 2018-07-11 It occurred to me today that I don't have to swelter in the sun and heat outside to play with my antenna! After all I've got 25 ft of RG174 running from the antenna to my ZM-2 tuner! And I wanted to check out the newly arrived 4 ft RG174 BNC cable to connect the tuner and radio. The new smaller cable seems to work just fine. So I erected the Wonderpole a little closer to the back door, anchored the feed end of the antenna to a patio chair even closer to the back door and ran the RG174 feedline under the door to my ZM-2 tuner sitting next to my FT-817, key and note pad on what we used to call a TV tray inside my air-conditioned house! Bingo. 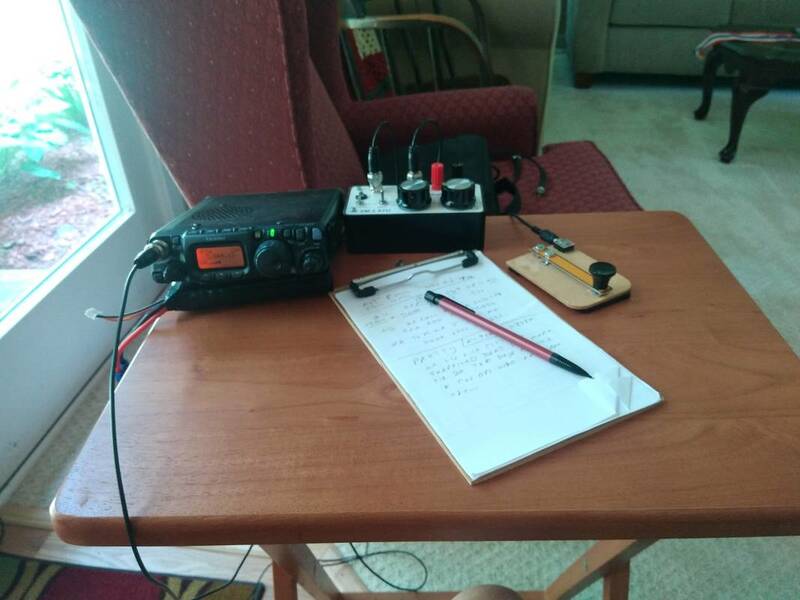 I was nice and comfortable as I made my one contact for the day with N5PST in Louisianan on 20 meters. He was a 599 in here but was too busy in a contest to give me a signal report. But I'm happy. It all worked one more time. 2018-07-10 Today I wanted to try one more thing with the 35 ft end fed wire, bypass the 1:4 balun and go straight to the tuner with the radiator and counterpoise. It didn't work. I could not get a decent SWR that way on any band with the Emtec ZM-2 tuner. 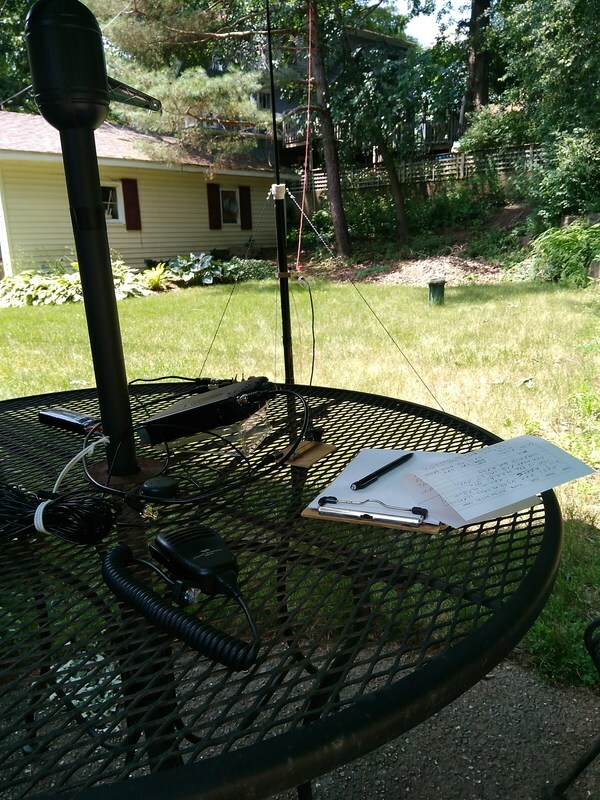 2018-08-09 I just finished another 20 meter 5w SKCC QSO with N3QW in Maryland. He gave me a 569 and he was 579 in here in SE Wisconsin. It took 8 minutes to get the mast, antenna, counterpoise and coax connected. Another 2 minutes were required to get the FT-817nd out of the bag, connect the battery, key and antenna up through the ZM-2 tuner. I immediately heard N3QW calling CQ ON 14.54mhz so answered him! Ten minutes later everything was down, packed up and I was back in the house! A total of 28 minutes! Fun! I keep "dreaming" about taking this setup on a local "backpack" walk and setting up in some nearby semi-wilderness area. I even got up this morning planning to do that. But somehow life interferes and I ended up in the back yard again! Never mind. I'm having a good time and making some QRP contacts under less than ideal conditions with what seems like a compromise antenna. That's at least part of what it's all about. 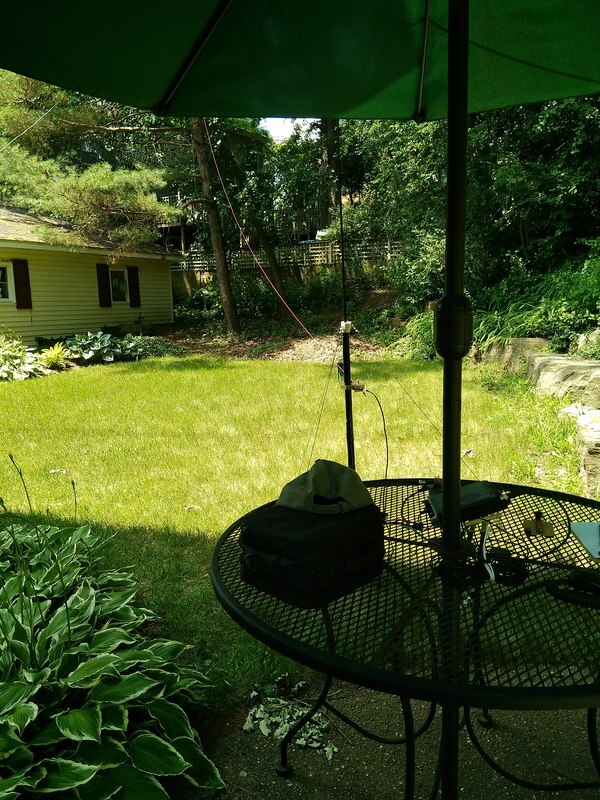 2018-07-08 Yesterday and today I used my new EMTECH ZM-2 Antenna Tuning Unit with the 35 ft antenna. It works really well. Even though band conditions were what could likely be called terrible, I managed five QSOs on 20 meters CW at 5 watts. It helps that both days were Weekend Sprints so a lot of people wanted QSOs. This tuner is really easy and fast to use and though I've only had it two days, I can recommend it along with the 35 ft wire antenna. The pictures at right show the result. I made it with very fine RCA speaker wire, #22 or smaller which is fragile tangles! And fed it with a 25 ft length of RG174 coax to my tuna Tunah ii. A short length of RG58c/u continued to my FT-817nd. 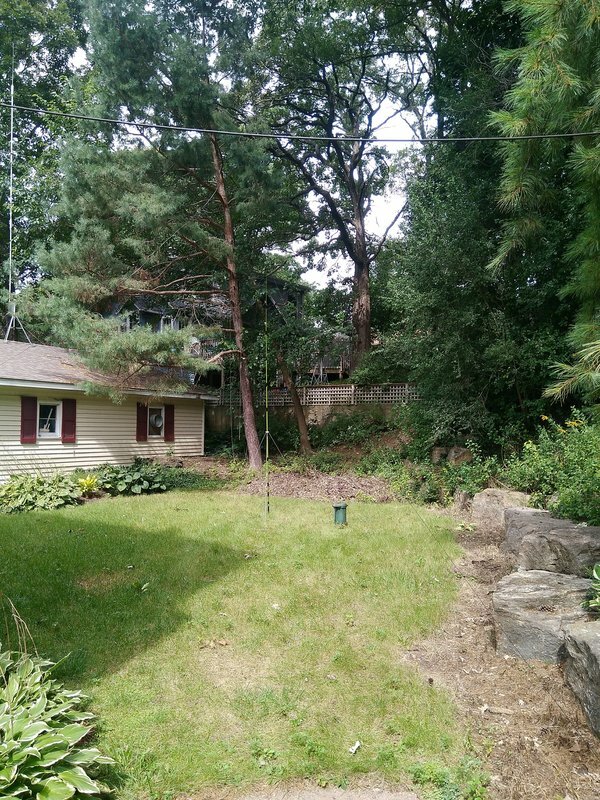 2018-07-06 I can't get enough of the 35 ft end fed wire! Looking at various commercial versions of portable "long wire" antennas I was fascinated that some of them build the balun into the winder and the whole thing is supported with a shock cord to a tent peg in the ground or to a picnic table or whatever, eliminating the need for any kind of pole at the driven end. So, that was my challenge today. One web site suggested that a 25 ft coax serves as a counterpoise. So I tried to tune it up without a counterpoise using my tuna Tunah ii. It tuned fairly well on 20 but not on 40. I then clipped on a 15 ft counterpoise and it tuned up easily on 40, 30 and 20. And it works! Even though only 20 meters was live, and barely so, I did successfully log K2H, the Thirteen Colony Commemorative station in Massachusetts. He was a solid 559 in here and gave me a 599, his standard report! 2018-07-04 After my wife and I took a walk in town and had a nice breakfast at a local restaurant I decided to mess with the 35 ft antenna again. This time I wanted to support the far end with my Wonderpole (about 16 feet up) and use my LDG 4:1 balun mounted near the transmitter. The solution was to velcro the balun to a snow stake I found in the garage. That stake won't be needed for a while for its intended purpose! The picture below shows the result. I liked the way it set up and tuned up, but the bands were about as close to dead as I've heard them so no QSOs logged. 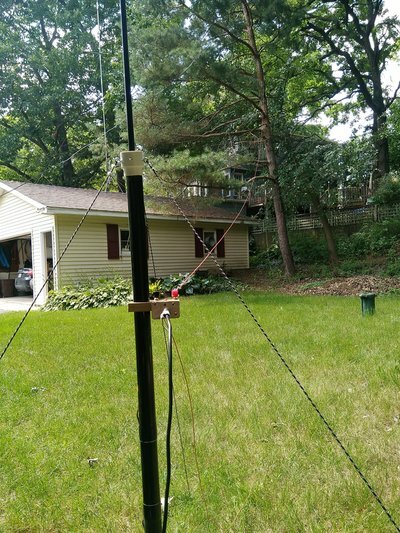 2018-07-03 Yesterday I played with the 51 ft wire antenna using my newly re-fabricated 4:1 balun/connector described on that page. It was difficult to string up the 51 ft wire requiring quite a bit of fiddling with ropes, etc. I did get it up after a fashion but it was way too low. That got me thinking about how much easier the shorter 35 ft wire would be to set up. 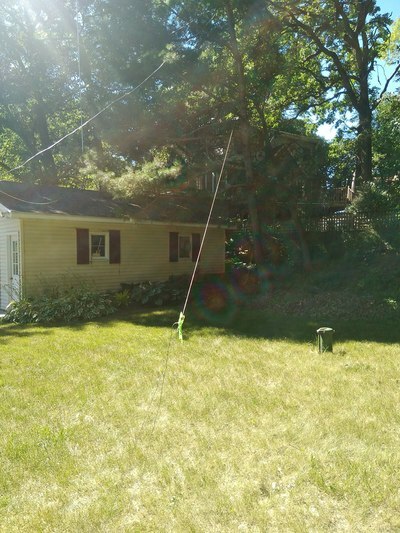 The 51 ft one actually had a disconnect I had installed at 35 feet so I disconnected that and using a pull-up rope I already have in a nearby pine tree for playing with antennas, hoisted it into the air. 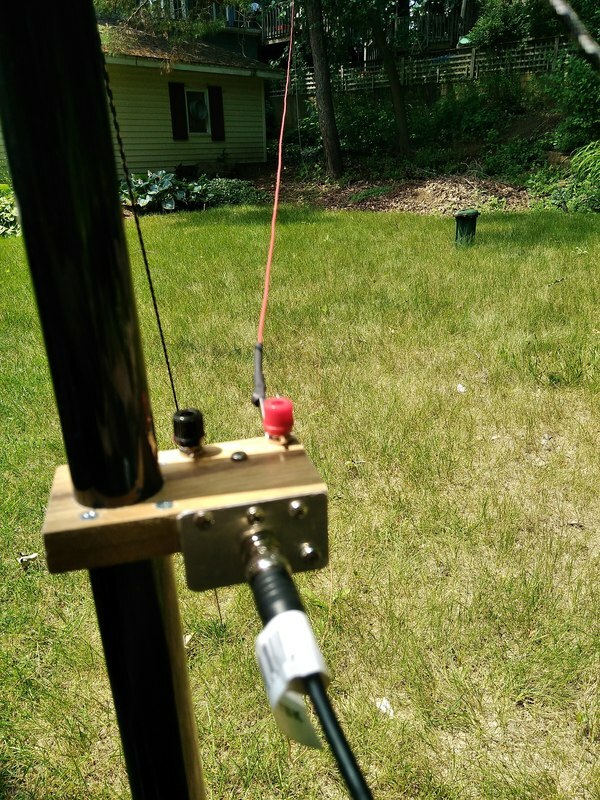 I connected the Wonderpole mounted connector/balun to the Tuna Tunah ii with a 3 ft BNC coax. Lastly, I connected my FT817nd to the tuner using a six foot BNC coax. I laid a 15 ft counterpoise out on the ground beneath the antenna. It tuned up nicely on 40, 30 and 20 meters. There was very little CW activity on any of those bands when I got it all connected at about 1:00pm. The few week signals I heard apparently didn't hear me. Then about 1:40 I heard N3QW in Maryland calling CQ SKCC at 14.05mhz. His signal was 589, so I called him. He responded immediately, giving me a 549 describing my signal as "solid but weak." I took it! The photos above show the backyard setup. I just had two more QSO's all CW, one on 20 and one on 40 meters. The 20 meter one was at 3:10 pm CDT with one of K2B, one of the 13 colony special event stations. He was booming in here, a true 599. He gave me a 599 also but I noticed everyone was 599 with him! The 40 meter one was at 3:20pm CDT with KZ3T in NC. he gave me a 449 and he was 539 in here. I don't think this is "the ideal" antenna, but given its short length and ease of setup it seems like a clearly functional portable option. Now I'm getting the hair-brained idea of actually mounting the Tuna Tunah ii directly to the terminal/balun. It seems that would reduce losses in the coax from the balun to the tuner and present the coax from the transceiver with near 50 ohms. Tuning might be interesting unless everything within arms reach! 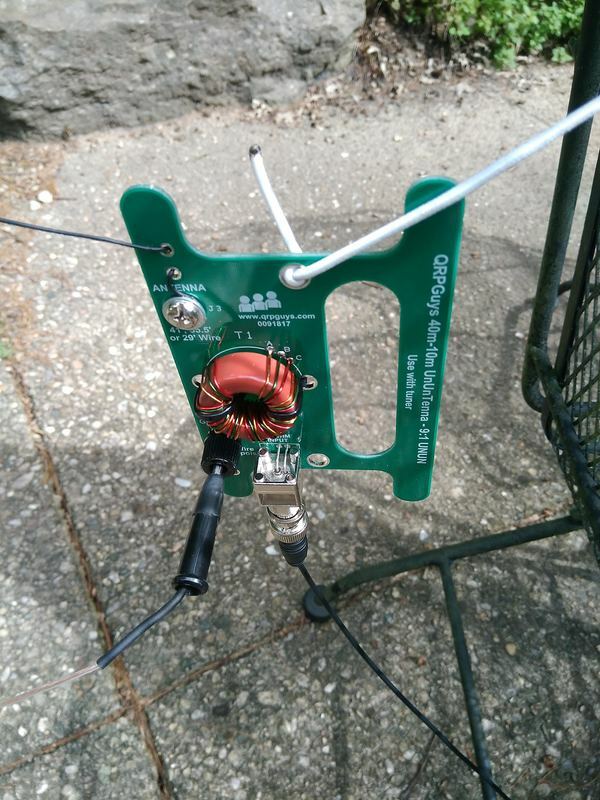 2015-05-10 After a recent QSO using the 51 foot antenna with W1SFR i looked up his web page where he describes an antenna he sells that uses a 35 ft end fed wire. So I decided to give a 35 ft wire a try. I strung it up exactly like the 51 footer and left the same counterpoise connected. Everything else remained the same, that is the Tuna Tunah ii matchbox and FT-817nd. I was able to get a near perfect match on 80, 40, 30 and 20. Propagation is terrible today so not sure I'll get any useful on-air observations today but at least it can be matched up to the radio with the Tuna Tunah ii. 5/20/15 Just had my first QSO with the 35 foot wire with N8HLH, Midcars control operator in Marquette, MI about 550 miles north. Conditions are not good at all as a magnetic storm that hit yesterday is just fizzling out. But he managed to hear me. Will keep testing before making any judgments on how well this antenna performs. 5/21/15 It's 5pm here and in SE Wisconsin and I just completed a solid QSO with VE9GU up in New Brunswick, Canada, about 1150 miles north east. He was a 58 and gave me a 55. All that with the 35ft wire tied to my Tuna Tunah ii and driven at a whopping 5 watts by my FT-817! At least I know the 35 foot wire does work! Later in the evening still using the 35 foot wire I tried to answer a very strong call from 8 land on 40 meters CW but he apparently didn't here me. I also called CQ a number of times on both 40 and 30 meters with no response. Not sure if that indicates anything useful but it is the way it was! I'll keep experimenting.